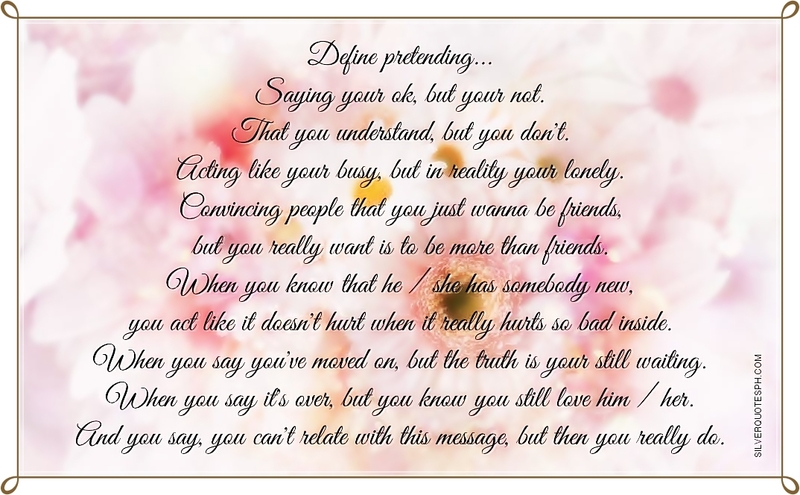 Define pretending... Saying your ok, but your not. That you understand, but you don't. Acting like your busy, but in reality your lonely. Convincing people that you just wanna be friends, but you really want is to be more than friends. When you know that he / she has somebody new, you act like it doesn't hurt when it really hurts so bad inside. When you say you've moved on, but the truth is your still waiting. When you say it's over, but you know you still love him / her. And you say, you can't relate with this message, but then you really do.